Afghanistan's security forces patrol of Kunduz city, north of Kabul, Afghanistan, Sept. 29, 2015. 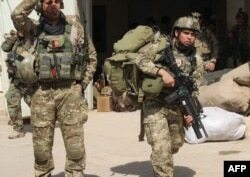 Coalition special forces encountered a threat from Taliban fighters during an intense battle in northern Afghanistan to recapture the key city of Kunduz, which the militant group seized this week. A U.S. Army spokesman, Colonel Brian Tribus, told VOA the incident happened early Wednesday near the Kunduz City Airport while coalition advisors including U.S. service members were assisting Afghan security forces fighting the Taliban. He said U.S. warplanes carried out an airstrike to eliminate the threat, after conducting two separate strikes on Tuesday in support of Afghan troops. Afghanistan's intelligence agency said one of the coalition airstrikes killed the Taliban's shadow governor for Kunduz province along with 15 other people. But the Taliban on Wednesday reported that the governor, Mullah Abdul Salam Akhund, was not killed in the strike. The militant group posted an audio interview apparently with the governor in which he dismissed reports about his death, according to the Taliban Voice of Jihad Online. Kunduz Airport was the site of heavy clashes late Tuesday after Taliban fighters staged a major attack on the complex. Afghan forces have been battling the Taliban to recapture Kunduz in fierce fighting that has killed or injured more than 100 civilians and forced 6,000 people to flee the city, according to the United Nations Assistance Mission in Afghanistan (UNAMA). "The reports of extrajudicial executions, including of healthcare workers, abductions, denial of medical care and restrictions on movement out of the city are particularly disturbing," UNAMA chief Nicholas Haysom said. The Afghan army has been trying to send more troops from the south up into Kunduz, but Taliban roadblocks and landmines have blocked them from advancing in Baghlan province. Taliban spokesman Zabihullah Mujahid said Wednesday there were intense clashes going on in northern Baghlan. President Ashraf Ghani told reporters Tuesday in Kabul that national forces have made quick advances and retook control of several buildings. He said that airstrikes have inflicted heavy casualties on the opposition, insisting Taliban insurgents are using residents in Kunduz as “human shields”. Ghani called for calm and appealed to the nation to trust Afghan security forces, saying they are determined to retake Kunduz very soon and restore peace to the region. Taliban spokesman Mujahid rejected as government propaganda that Taliban fighters have indulged in looting banks, shops, government and non-government offices. Afghan special forces arrive at the airport as they launch a counteroffensive to retake the city from Taliban insurgents, in Kunduz, Sept. 29, 2015. Taliban insurgents overran the Afghan city of Kunduz on Monday in a surprise multi-pronged offensive. This was the first time the insurgent group captured a major city since being ousted from power in 2001. The Pentagon said the situation in Kunduz remained "fluid," but expressed confidence in Afghan security forces Tuesday. "We've seen them respond in recent weeks and months to the challenges they've faced. And they're doing the same thing in Kunduz right now," said spokesman Peter Cook. He called the Taliban advance Monday "clearly a setback" for Afghan security forces. Doctors Without Borders (MSF) in a statement Tuesday said that its hospital in Kunduz has treated around 50 children. It said that the majority of patients it has treated so far "had sustained gunshot wounds and surgeons have been treating severe abdominal, limb and head injuries." Defense Minister Masoom Stanekzai, while speaking in Kabul, confirmed the deaths of 17 security forces. 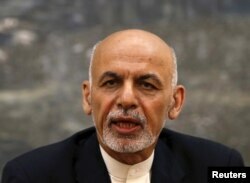 He urged the Taliban to cease the bloodshed and try to resolve differences through peaceful means. The battlefield setback came as Ghani’s government completed its first year in power. The Afghan leader has already been under fire for failing to improve governance and security around the country, and counter widespread corruption in state institutions. Angry lawmakers in Afghanistan's lower house of parliament called Wednesday for an investigation and accuse the government of failing to prevent the attack on Kunduz despite knowing the Taliban was nearby. Afghan spy agency chief Rahmatullah Nabil apologized to the chamber and the nation for what has taken place in Kunduz. He was summoned to appear along with Interior Minister Noorulhaq Olomi to explain the fall of the city. Nabil told reporters Tuesday that there were 600 inmates in the detention center, including more than 100 "low-level" Taliban fighters. The United Nations and international rights groups have called on all sides to safeguard civilians. The Taliban had come close to capturing Kunduz when it launched a spring offensive in April but Afghan security forces repelled the assault. President Ghani and other top officials had promised at the time they would not allow the insurgents to come closer again.